...and not always in a good way! When you need more than the real thing, you need JC Backings Digital Department. We can turn gray skies blue, build your dream skyline and create pretty much anything else you need. For “Charlie’s Angels,” we shot two different locations to create the final backing. The real locations stopped the show, but the final backing is a vivid, iconic custom view of the South Beach Miami skyline. Whether it’s a custom shoot, using images from our stock library, or a combination of both, our digital artists can bring your vision to life. 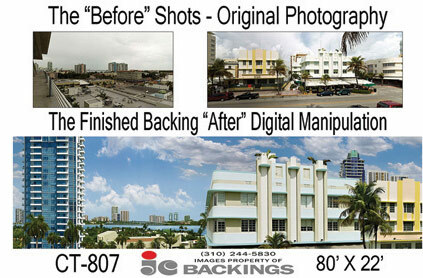 Call the experts at JC Backings today! To see more examples of our “Before & After” images, click here.